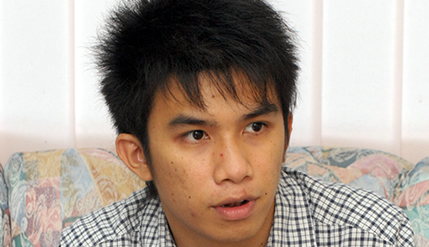 BANGI, 2 September 2010 – A final-year actuarial science student of Universiti Kebangsaan Malaysia (UKM) has done the university proud by bagging the John Culver Wooddy Scholarship award of the Actuarial Foundation of the United States of America. Kelvin Yeong Song Bor, 22, is among 13 students from around the world who are recognized with the coveted award of US$2,000 after sitting for an actuarial examination conducted by the Illinois-based Actuarial Society last April. He followed the footsteps of Tang Khai Sheng the first winner from UKM, who was also recognized for his achievements in the examinations of the society last year. Tang is now working with Bank Negara. Kelvin, the eldest son of a carpenter and a housewife in Mentakab, Pahang, is the second actuarial science student of UKM to win the award. Apart from the US, the other students who won the awards come from Canada, Ghana and the United Kingdom. The Actuarial Foundation, in a statement said it was pleased to announce that the National University of Malaysia student Yeong Song Bor is a recipient of the Foundation’s John Culver Wooddy Scholarship. Bor, who was awarded $2,000 is the only recipient from Malaysia and joins 12 other students from around the world recognized with this prestigious scholarship. Kelvin told UKM News Portal he applied to the society to vie for the award with the help and encouragement of Assoc. Prof Noriszura Ismail, who was then the Head of the Actuarial Science Programme of the School of Mathematics Science. Apart from the recommendation of Assoc Prof Noriszura and his UKM academic results, he said the other important factor in bagging the award was his results in the society’s examination. Kelvin had sat and passed five out of 10 of the examinations conducted by the Actuarial Society. He said his aim is to be accepted as a Fellow of the society. For the moment, he needed to sit and pass two more examinations to be accepted as an Associate Fellow. Kelvin who has two younger brothers and a younger sister, said he planned to use the award money to sit for the other examinations and probably do his Masters later on. “The money will help to pay for my examinations which are rather expensive. It is also a recognition for all my hard work at UKM,” said the alumnus of Hwa Lian High School in Mentakab. He plans to work with an insurance company after his graduation next year. “That is what an actuary actually does…. Calculating insurance risks and premiums in an insurance company,” he said, adding that the field is very specific and limited since there are only 16 insurance companies in the country. Kelvin who has won an OCBC Bank bond-free scholarship since his 2nd year with UKM, took a study leave to go to North-Central University in Illinois as an exchange student for nine months under a state department scholarship. Meanwhile, Assoc Prof Noriszura said she is very proud of Kelvin and that he won the coveted award because of his co-curriculum and academic achievements. She is very proud of her actuarial science students as it is a professional course and the students have to take the professional papers set by the US society. “Half of the class passed at least one paper last year, “ she said, adding that the others did not sit for the examination partly because the fees were expensive and partly because they were not ready for it. The exams were conducted in Kuala Lumpur at a fee of RM500 or more, depending on the level. “The best result we had was last year when five of our students passed all the five papers!” she said, stressing that the performance was certainly among the best in the world. In 2007 and 2008, only one UKM student passed all five papers in one year. Assoc Prof Noriszura said from UKM’s experience, the earliest an actuarial science student can pass all 10 papers of the society is two years after graduation. This is probably because the last paper is the toughest and most comprehensive, lasting six hours when the student would have to resolve real-time problems with some actual work experience. She pointed out that UKM’s actuary science students were a cut above the others because their entry points were higher. “Sometimes, they get bored with us if we are slow,” she said. UKM was the first to offer actuarial science at the degree level since 20 years ago.